ITECS recognizes that for the best project performance, the best skills must be deployed for the job required. This is also the greatest challenge in the industry. The right skills are difficult to find in the combination required, and also at the right time. This leads to delays and quality issues, leading to poor project performance. 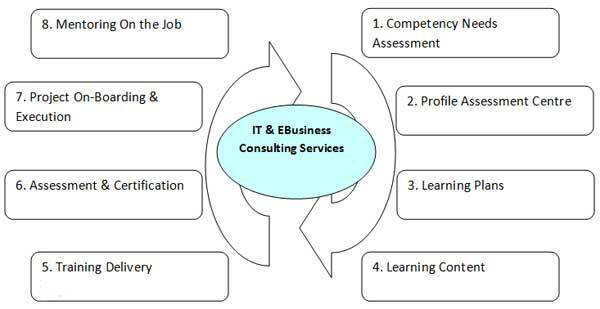 To accomplish this in the most effective and efficient way, ITECS follows the 8-Stage model shown above. The eight stages leading to excellent performance of staff on projects define the business interventions that ITECS has developed. The effectiveness of these interventions can be seen in the excellent track record of professionals placed by ITEC on projects, whether internal or Client projects. As project requirements crystallize, the competencies required also become clear. While executive profiles are standard, the middle and senior profiles have their challenges of specific skill combinations required, which ITECS meets elegantly. Each profile that has potential is assessed for the competencies required, and only then an assignment is recommended. The ITECS assessment center uses techniques that include tests, both technical and behavioral, apart from interpersonal evaluation where required. Learning Needs Analysis is done on the competency gaps assessed in profiles, to ensure the most efficient and effective learning plans are drawn up. The Learning Plans also ensure the competency gaps are addressed within the shortest time possible. Learning Plans identify structured content and delivery programs for each profile. The common learning areas for typical profiles define standard programs. Learning Content is the key to effectively rolling out the Learning Plans. ITECS has content acquisition and development partnerships to ensure the most effective content becomes available to individuals in the appropriate mode at the right time. ITECS ensures the delivery of Training is done effectively, to meet all the objectives planned in the individuals’ Learning Plans. ITECS conducts certification programs if required, to ensure the alignment of competencies to standards. Assessment of training effectiveness is always done, to ensure competency development objectives are met. A structured on-boarding plan gives all the orientation required to each consultant being assigned to a project, so that they can hit the ground running and begin contributing meaningfully to the project with very little lead time. Even after individuals settle down and start performing to project plans, ITECS provides mentoring support to its staff at periodic intervals, as well as when it might become necessary for any reason. Mentoring has the greatest benefit of establishing excellence as a habit in the individuals’ performance.